10 year enrollment history. Graphic by Cecilia Kohl and Adam Palacios. This fall, TJC’s population hit a record high with 12,270 students enrolled. Last fall, there were only 11,881 students enrolled, meaning TJC has seen a 7 percent increase in just one year. In addition to expanding the number of “fast track” events, the time of the events was also expanded to fit schedules of students who work longer hours by offering a “late evening and Saturdays,” Lessner said. Besides events, Director of Public Affairs and Media Relations Rebecca Sanders said that “communication, [such as] text messages and emails, [were sent to] students that were really close to completing their paperwork.” These reminders encouraged students to “be ready,” Sanders said. This is so great to see! 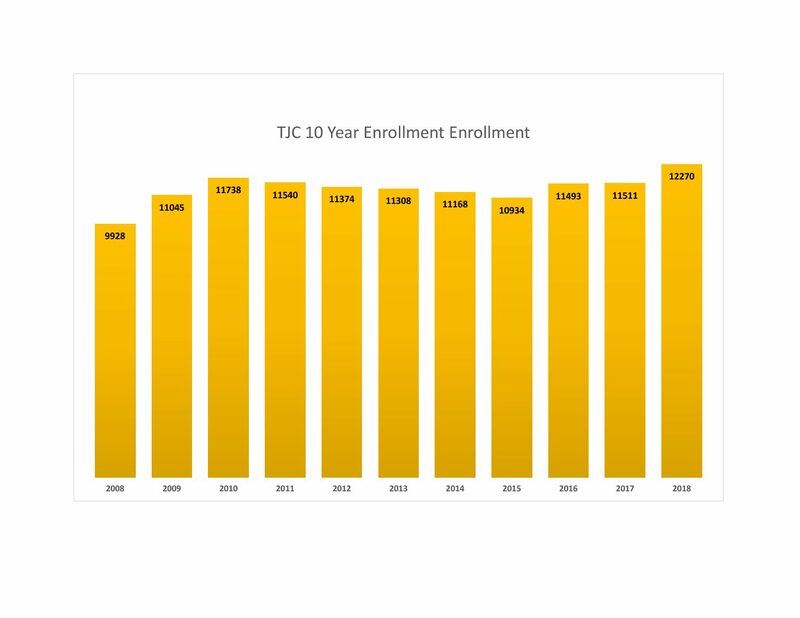 Hopefully as the years go on, TJC’s enrollment will continue to increase. The “fast-track” events are truly great in helping students enroll into TJC.